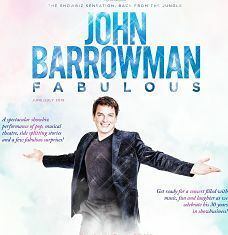 John Barrowman will embark on a 12-date Fabulous tour of England, Scotland, and Wales celebrating his 30 years on stage and screen with favourite songs and fabulous stories from his life and career. this summer opening at London’s Savoy Theatre on Sunday June 16th. John is a singer, actor, dancer, presenter, judge and author. Most recently, UK audiences delighted in supporting him as he made the final three in ITV’s I’m A Celebrity Get Me Out of Here 2018. Speaking about the tour he said: I can’t believe it’s been 30 years from my West End debut in Anything Goes to my Australian jungle adventures in I’m A Celebrity, and there’s been lots of fabulousness in between. I’m thrilled to celebrate this amazing milestone with my FABULOUS tour. I’m looking forward to meeting fans and sharing some of my favourite moments with you all.